Harvard President Drew Faust (left) and Gen. John Hyten at the ROTC Commissioning Ceremony. "You are receiving your commissions at a moment of extraordinary challenge for our society and the wider world,” Faust told the graduates during the ceremony in Tercentenary Theatre. Standing on the steps of Memorial Church, near walls inscribed with the names of Harvard’s war dead, six graduating seniors swore allegiance to the Constitution on Wednesday and received their first salutes as officers in the armed forces. 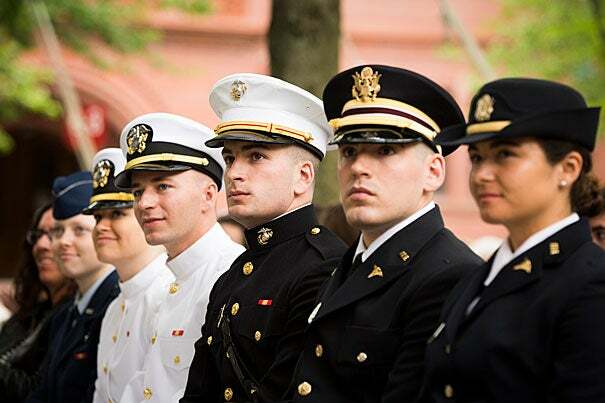 The tradition-filled Reserve Officers’ Training Corps commissioning ceremony, held before a small group of families and friends at Tercentenary Theatre, honored the new second lieutenants and ensigns at a time when leadership is badly needed, Harvard President Drew Faust said. Polls have shown that confidence in institutions is low, Faust noted, with public trust in government leaders below 30 percent and business leaders below 40 percent. Faith in the military, however, remains high, at more than 75 percent, likely because the military’s mission is a selfless one — to protect and defend others, no matter the personal cost — at a time when many seem to be out for themselves, Faust said. As part of the ceremony, the new leaders took the oath of office, had their insignia of rank pinned to their uniforms by family members or friends, and received their first salute. Gaining their commissions were Army 2nd Lts. Rachel Milam and Luke Pumiglia, Marine Corps 2nd Lt. Michael Murray, Navy Ensigns John Holland and Lauren Mandaville, and Air Force 2nd Lt. Kira Headrick. “It’s very humbling … to join something bigger than yourself,” said Pumiglia, who is heading to medical school at the University of Michigan in July, with plans to be an Army physician. Pumiglia said he joined Army ROTC largely because of the values and the dedication to service that his parents instilled in him as he grew up. Harvard’s relationship with the military is older than the country, dating to the Pequot War. 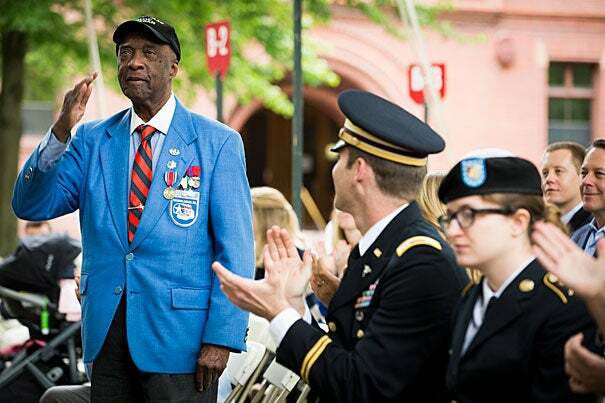 Since that 1636 conflict, more than 1,200 from Harvard have lost their lives in military service, and 18 — more than from any other U.S. institution of higher education — have been recognized with the Medal of Honor, the nation’s highest military award. Memorial Church, which honors those who have died in conflicts since World War I, is among several memorials to Harvard service members. 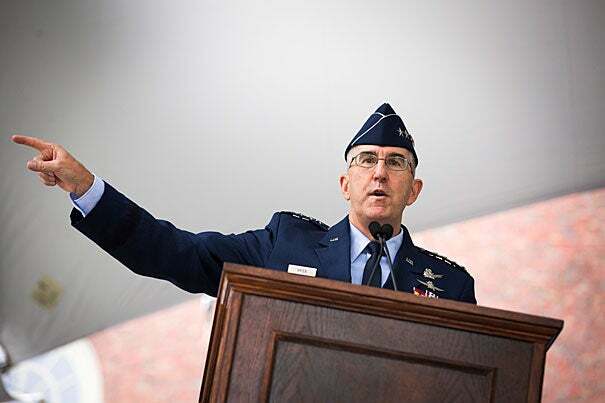 Also speaking Wednesday was Gen. John Hyten ’81, who participated in Air Force ROTC before graduating. Hyten recalled his own commissioning, which took place at MIT because Harvard had ended ROTC’s formal University presence during the Vietnam War, and praised Faust for her efforts to return ROTC to campus, starting in 2011. At the time of his commissioning, Hyten planned to serve his four-year obligation and then leave the Air Force. His plans changed. Now, three decades later, he is commander of U.S. Strategic Command, encompassing nuclear, cyber space, electronic warfare, missile defense, and other forces. Hyten told the newly commissioned officers that that their Harvard degrees, while something to be proud of, will matter little once they arrive at a base or on a ship. All that will matter then is their rank and the expectation that they will show leadership, even in difficult situations when people are in harm’s way. Harvard Chan School student Daniel Schlauch loved making data work for him, until he realized he could use data to fight disease. After he accepts his Ph.D. in biostatistics, he'll be taking the fight to cancer.